Two Headed iMac. No Plans For Risky Surgery. It's both fascinating and a bit horrific to look at! got a link about that? It was one of the "freaks" at the Tekserve booth at Macworld. 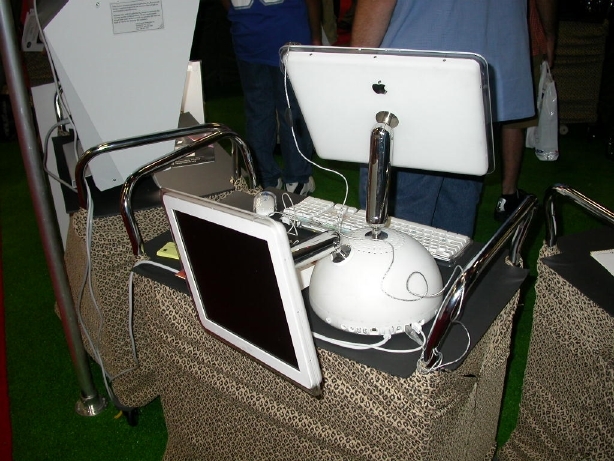 They also had a bearded iBook, a beige iMac, and a happy mac that was burned. Tekserve is THE mac shop in New York. nice poster for the "Two-headed iMac" on the Tekserve site. Does the second display work? Along those same lines, I've always thought it would be really neat if I could connect a sh!t PeeCee to my iMac monitor with a KVM switch. I mean, it would take some soldering, but just imagine jumping between PlanetSide on my PC and OS X on my iMac... all through the iMac screen. It would take some balls of steel and some knowhow about the connector Apple uses for the LCD screen... if it's VGA, you could just solder the right connections and have the KVM box right outside the iMac... and quite a bit of cables snaking through the shell. seems like an awful lot of work. just buy a nice flat panel for your PC and preserve your warranty. Nice. I'd pay someone if they could do that for me. I've always wondered why laptops and AIOs don't have video IN, ever since the Mac toasters (Classics.) For example my chem teacher a million years ago got an LC II and wanted to use his Color Classic as a monitor for it. I told him it was impossible and also took home his Color Classic. But video in would be so EASY, just add a port and a switch next to it to toggle which computer uses the display. This would be really cool if you could plug in an adapter that some 3rd party company would make and could have an iMac controlling a whole server room or lab! KVMs are awkward and Remote Desktop and VNC will be too slow to be practical for many years. Yeah, PC flat panels are well priced and have okay quality. But that's not the point. I don't want no extra flat panel. I want a PC on my iMac FP. If I bought a gaming PC, I would like to double up on my monitor, just to save costs and space. I dunno, I thought it would be pretty cool, too.